Scientists Create Fertile Eggs From Mouse Stem Cells : Shots - Health News For the first time, scientists have created fertile eggs and healthy offspring using embryonic stem cells. The experiments in mice raise the possibility of artificial egg production and new infertility treatments for humans someday. 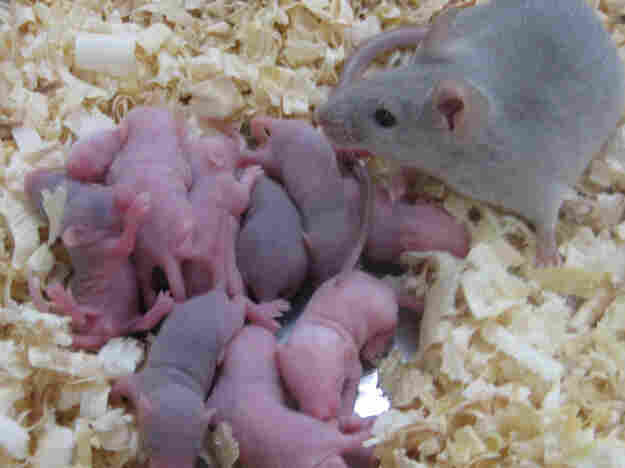 Each of these mouse pups was born from an egg scientists created using embryonic stem cells. It's possible the technology could change future treatment for human infertility. Scientists in Japan report they have created eggs from stem cells in a mammal for the first time. And the researchers went on to breed healthy offspring from the eggs they created. While the experiments involved mice, the work is being met with excitement — and questions — about doing the same thing for humans someday. "Wow. That's my general reaction," said Hank Greely, a bioethicist at Stanford University who studies stem-cell science. "Repairing hearts, repairing brains, repairing kidneys, that's all good and important, and we'd all love to be able to do that. But this involves making the next generation." Scientists obtain the versatile cells from embryos. Embryonic stem cells are controversial because researchers destroy the embryos to get them. But because these stem cells can morph into any cell in the body, there's always been the possibility they could do something especially profound. They could offer a way to create eggs from anyone at any age. That could change how humans reproduce. In this week's issue of the journal Science, Mitinori Saitou and colleagues at Kyoto University in Japan report they finally achieved that elusive goal. "This is actually the first time to make eggs from embryonic stem cells and then produce eggs [that] become healthy offspring," Saitou said. Moreover, Saitou's team did something potentially even more astonishing: They bred healthy mice from eggs made from another type of stem cell known as induced pluripotent stem cells. These are cells that look essentially identical to embryonic stem cells. But instead of coming from embryos, they can be made from adult cells, such as skin or blood cells. So they don't have any of the ethical baggage of embryonic cells. "They're gotten to what was our Holy Grail, which is making eggs," said George Daly, a leading stem-cell scientist at Harvard. "It's like cellular alchemy. I mean, they can turn lead into gold here. They can turn skin cells or blood cells into eggs." The big question, of course, is whether anyone could do the same thing for people. No one knows for sure. And it would surely take a ton of work. But John Gearhart, a stem-cell pioneer at the University of Pennsylvania, says mice are close enough to humans to think it's probably doable. "I think this will be worked out in time. I don't have any doubt about it," Gearhart said. And if he's right, then, at the very least, it would be a huge advance for women who are infertile for medical reasons or who have postponed having babies too long. "If we can make eggs from stem cells, then the biological clock isn't ticking so much for women," Stanford's Greely said. But that could be just the beginning. The same team previously made sperm from stem cells. So, for example, the power to create sperm or eggs for anyone would be big news to many gay men and lesbians. And Greely goes even further into territory charted by the book Brave New World. Combined with other techniques, eggs from stem cells could some day make it much easier for parents to pick babies with blue eyes or blond hair, or a talent for sports or music. Speculation about the possibilities get even more sci-fi. "Any skin cell that you can find on the edge of a coffee cup theoretically could be induced back to being an egg, and a baby could be produced," said Ronald Green, a bioethicist at Dartmouth University. "When you think about the commercial possibilities of people selling to infertile people babies produced from George Clooney or Jennifer Aniston, or whatever, you have to worry about it," Green said. Now, it's important to remember that this may end up being nothing more than speculation. And even if it does prove possible, choices like these are probably decades away. Even so, David Prentice of the Family Research Council says such research "cheapens all life in a way, not just embryonic or fetal life, but babies and the rest of us when we starting treating life as a manufacturing proposition." But just the possibility is already stirring intense debate about where the power to use stem cells to make eggs might take us. "It's like any other technology," said Daniel Sulmasy, a professor of medicine and ethics at the University of Chicago. "Whatever we've done in human kind — whether it's discovering fire or creating the wheel — you can use these things to do lots of good and you can use them immoral ways," he says.